That\'s a really interesting story behind the photo. Thank you for putting that up. Also, even the BBC can be guilty of having a bias in it\'s reporting (though perhaps one could argue that it is less than with other broadcasters). See http://medialens.org/ for lots of evidence. Thanks again – I look forward to my daily new photo on your excellent site. Thanks for the link to http://medialens.org/, it\'s a wonderful place to find \'the other opinion\'. superb job including the dates in the foreground … and the accompanying story was great!!! 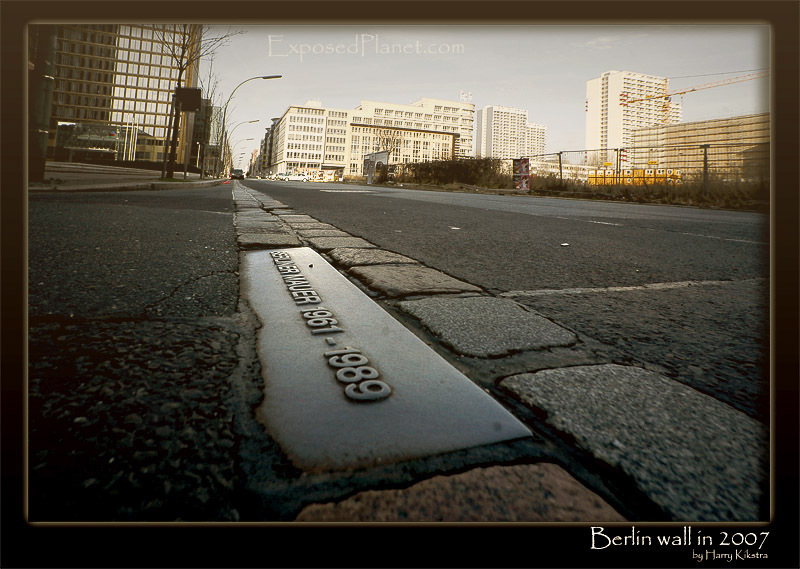 The story behind "Berlin Wall in 2007"
Nowadays the wall is gone, Berlin is one city again and all that remains is this brick line running through the city, where one side of the double wall used to be. The memorial stone reads ‘Berliner Mauer’, German for Berlin Wall. What is interesting about this scene is that the buildings in the middle (right below ExposedPlanet.com) are new as they are on the former no-man’s-land between the double wall. The building on the left is the Axel Springer Verlag, one of the largest publishing houses. As they were situated right next to the wall, on the western side, they started to broadcast messages on huge LED-powered screens, to inform the East Berliners about news that would have been censored out by the Communist party and the controlled media. So if you live in the US, take a look at Al Jazeera and other Arabic websites before you condemn an entire region as being terrorists and want to know what really is happening over there, if you live in Iran, check out CNN before you damn all the Yankees. And for everybody: try to use more objective press like the BBC website and Wikipedia. Never just believe what you see on your home channels..